I love the elegance and class associated with all things tweed. Adding neon trim really only makes it better. Well done, J. Crew. J. 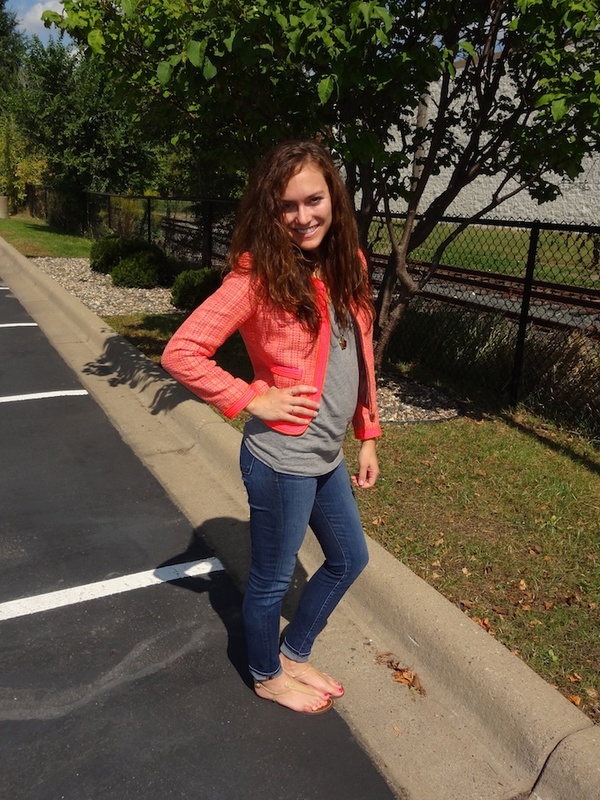 Crew blazer and vintage cotton tee, Marc by Marc Jacobs necklace, J Brand jeans, Sam Edelman's Gigi sandals. I can't find this blazer online, but I love this one as well. It's an excellent alternative, and perfect for fall! I don't think I could love your blazer more if I tried. Like I'm kindof obsessed with it. And I love that it could be worn to work or on the weekend with jeans and a tee! Wow. Wat a pretty jacket! I love the color combo. Oh I LOVE the tweed - so Channel! super cute jacket. Love it! I LOVE neon and I love tweed...so naturally this is just perfect! Hybid Hunter | Win some sunglasses in my giveaway! I love the vibrancy of the blazer! Don't think I've ever seen one that isn't majority black or white! Thanks! I was super excited to find it. I always think of neon as a little more punk, so it's great to see it mixed in such a classic pattern like tweed! cute. It doesn't look like fall is hitting you yet I wish! Thank you! It's coming on slowly. It's much colder at night though! that brighten up your whole outfit. I'm digging the neon tweed. You look sophisticated but also extremely trendy, looove it! Thank you! I'd love to follow each other! Thanks! I know, I wish I could have found it online! Sorry, but can you follow me once again? I totally agree tweed is amazing! So chic! Love the color of this blazer! Chic!